There’s only thing I like better than a healthy, easy dinner, and that’s a healthy, quick, simple dinner I can make ahead of time. 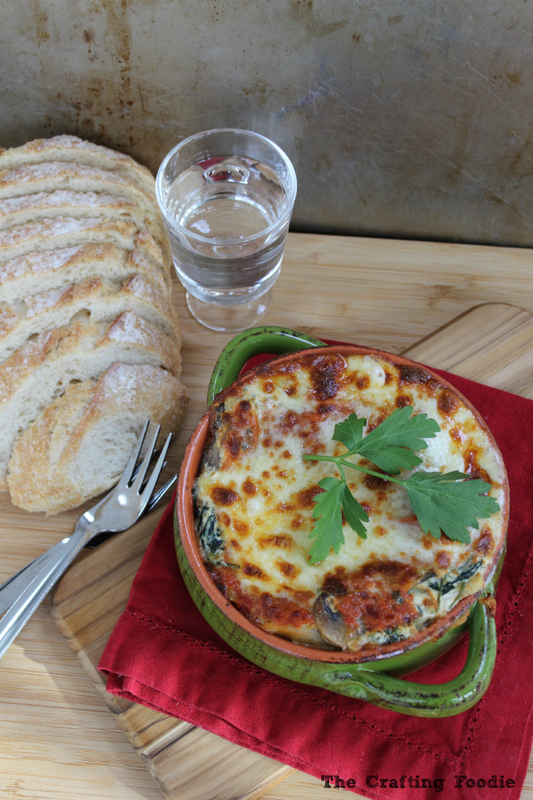 That way, when dinner times rolls around, all I have to do is preheat the oven and bake, and this Cannelloni Stuffed with Mushrooms, Spinach, and Cheese in one of my favorite make ahead meals. Since I have a small family (my two little girls aren’t exactly big eaters), I like to make a whole batch of this, and freeze it in two separate, 8-inch square stoneware dishes. I bake them directly out of the freezer, covered with foil. I extend the baking time for an additional 20 minutes, baking covered. Then I bake it for an additional 10 minutes without the foil. I make a homemade simple tomato sauce for this Cannelloni Stuffed with Mushrooms, Spinach, and Cheese, but to make it even easier, you could use your favorite prepared sauce. My kids love spinach and mushrooms, but you could use any vegetables. It’s actually the perfect dish to sneak in a variety of vegetables because the cannelloni is smothered in cheese. I often like to add red bell peppers and zucchini as well as the spinach and mushrooms. I would say that the most difficult part of the dish is boiling the pasta. Since you have to boil the pasta sheets and then separate them, it can be a bit difficult not to rip them. My solution is two part – 1: Place a table spoon of olive oil in the pasta water while it boils. 2: Boil a few extra sheets because some will inevitably rip. 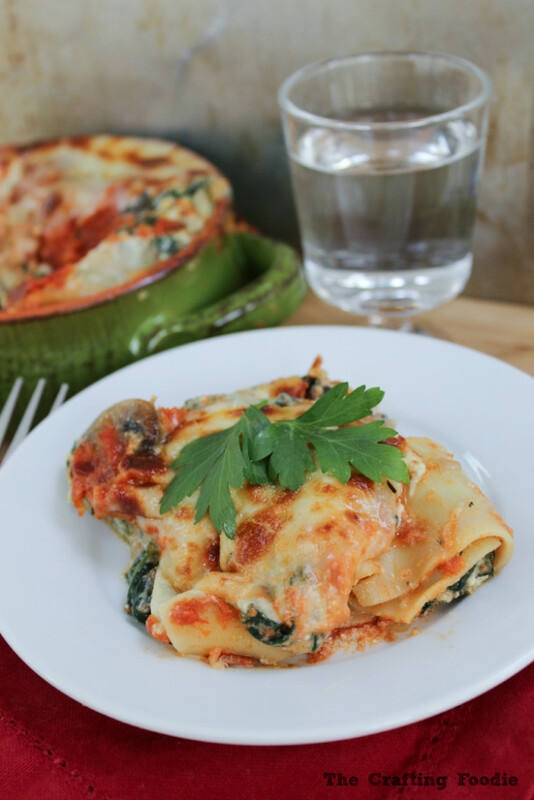 This Cannelloni Stuffed with Mushrooms, Spinach, and Cheese is one of my all-time favorite make ahead meals. It’s so satisfying, hearty, and delicious. But the best part is that you can throw it in the oven on a busy afternoon, and it’s a full meal ready by dinner time! This pasta is stuffed with vegetables and smothered in a quick, homemade sauce. It's the perfect make ahead meal; just pop it in the oven and bake. Spray a 13x9 inch baking dish with cooking spray. For the filling, in a large frying pan, heat the olive oil over medium. Add the onion and cook until soft, about 5 minutes. Then add the garlic, and cook for about a minute, Then add the sliced mushrooms. Cook until nice and golden, about 3 to 4 minutes. Add all the spinach, and allow it to wilt. Set aside while assembling the other ingredients. In a large bowl, mix the ricotta, mozzarella, and parmesan cheese, egg, vegetable mixture, oregano, nutmeg, and basil. Season with salt and pepper. For the sauce, add the olive oil in a large stock pot. Heat on medium high. Add the garlic, and cook until fragrant. Stir in the tomatoes, basil, sugar, and salt and pepper. Simmer for about 20 minutes, until thick. While the sauce simmers, boil the pasta. In a large stock pot, boil salted water. Add the olive oil to the water. Cook pasta for about 3 minutes. Remove pasta from the water. Place each pasta sheet on a cooling rack. To assemble the pasta, spread about ½ a cup of sauce on the bottom of the baking dish. Taking one sheet of pasta at a time, on the short of the sheet, place 3 tbs of filling topped with 1 tbs of sauce. Roll the pasta sheet up. Place the cannelloni in the baking sheet, seam side down. Continue to fill the rest of the pasta sheets. Top the pasta with the remaining sauce and cheese. Cover with a piece of foil and bake for 30 min. Remove the foil, and bake an additional 10 minutes until the cheese is melted and browned. This recipe is linked to these awesome link parties. Yum!!! Cheesy goodness…This looks fantastic! Very neat presentation..
Love recipes like this, looks divine! Anything stuffed with cheese is totally my kind of dinner! This looks SO good! Same here, Taylor! I’m a sucker for cheese, especially when it’s melted and gooey! I love all the vegetables added to this cheesy dish! This looks so comforting! Thanks so much Kristen! 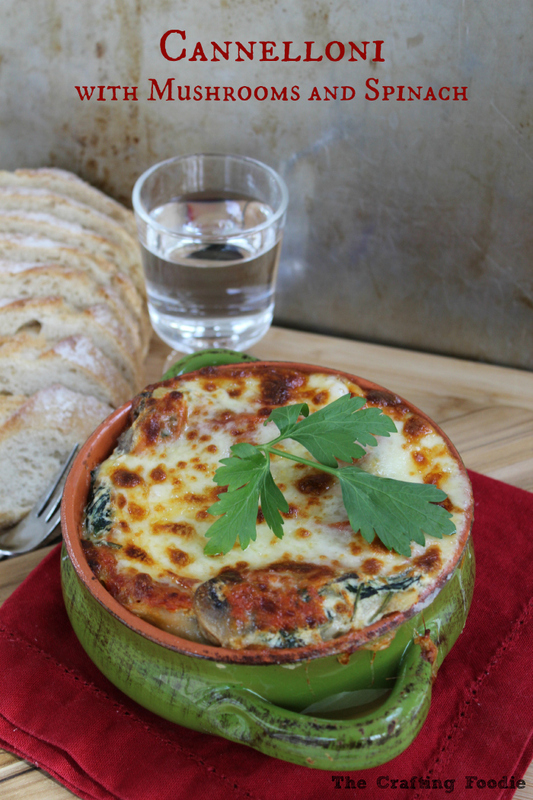 It’s the perfect dish to stuff as many vegetables in as possible because they get buried in a heap of gooey, delicious cheese! This looks so good! I love the mushrooms you added in. Comfort food for sure! Thanks so much Julia! Yes, it’s definitely comfort food at it’s best! I haven’t had cannelloni in forever, but I’m totally craving it after seeing those pictures. Yum! This recipe looks delicious! Individual servings are fun and special too. Thanks so much, Julie! I agree – single servings of anything make it just a little more special! Great recipe! Although, I layered it in the pan instead of the way the cook stated in the directions, it came out perfect. The ingredients flavor blended very nicely together even as a layered lagnaza dish. Thanks for sharing this master piece.